Sheffield Friends of the Earth - Solutions? Powering trucks by electric battery isn't a practical solution at the moment. 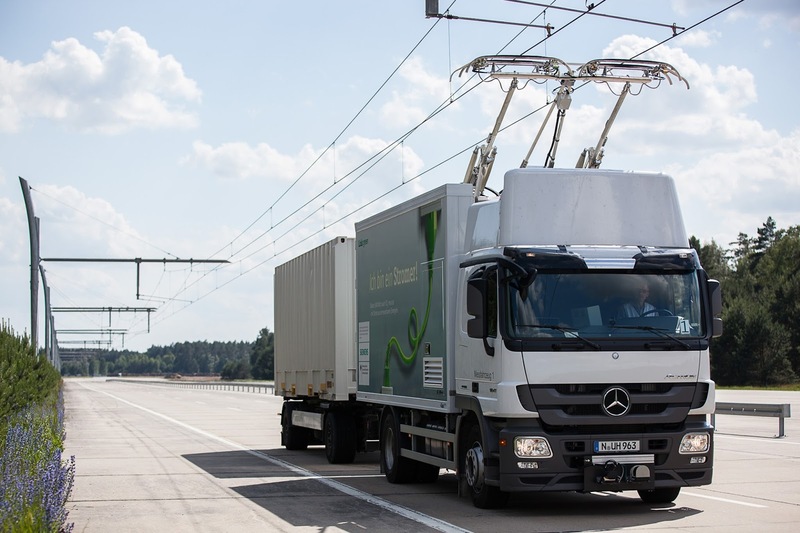 However, Siemens have developed the eHighway concept which allows trucks to be powered by electricity in a similar way to a train or trolley bus. The first lane of the motorway has overhead power lines (catenary system) which the trucks connect to by a pantograph (the bit on a train which connects to the wire). When the lorry isn't on a stretch of road with an electricity supply, or is over taking, it automatically switches to diesel-hybrid drive and lowers the pantograph. This means a lorry can be used just as flexibly and universally as conventional lorries. 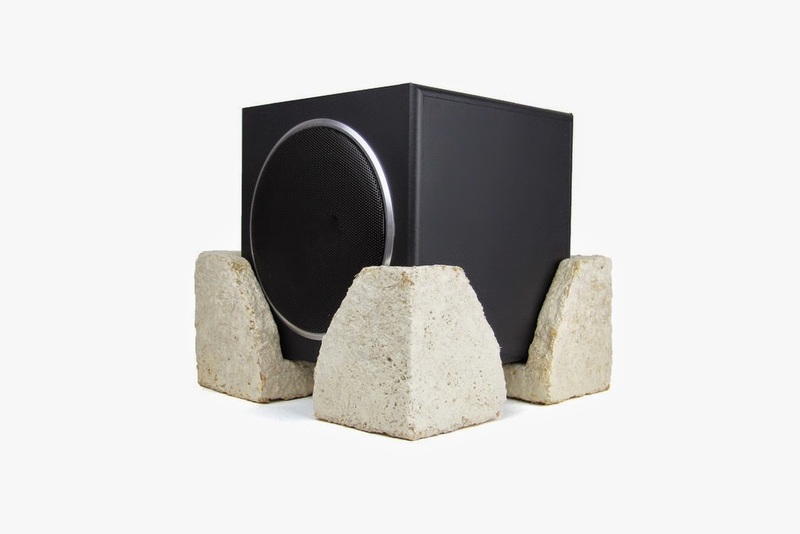 Easy to install: system can be seamlessly integrated in the existing road infrastructure. Environmentally friendly: no emission of CO2, nitrogen oxides, soot. 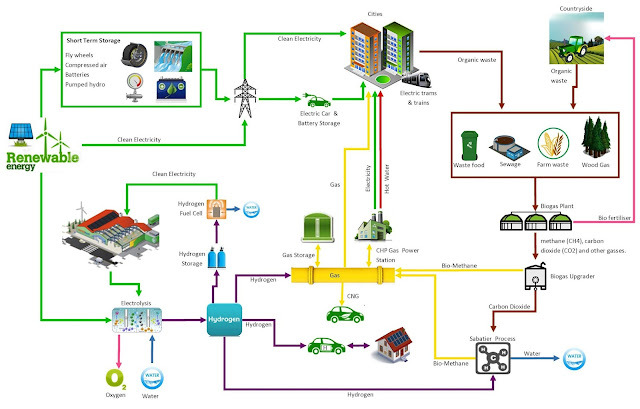 Electricity can come from renewable sources. Economical: electric motors are very durable and reduce the dependence on fossil fuels. Scaling up clean renewable energy systems will generate more electricity than we need. The Centre for Alternative Technology (CAT) have put forward proposals  which would generate about 1,160 TWh of electricity in an average year. The average total demand would only be around 770 TWh per year. However, the problem is that the electricity isn't necessarily generated when we need it. There will be a mismatch between supply and demand, with both large surpluses and shortfalls. The key is to develop large amounts of energy storage which can be saved until needed. At the moment technologies like fly wheels, compressed air, batteries and pumped hydro plants can't store enough energy to keep the lights on when there's reduced amounts of renewable electricity. For example, in 2010 there was little wind but a high demand for electricity due to the cold weather. The solution is to develop a technology called Power to Gas or P2G. Hydrogen can be made by the electrolysis of water – splitting H2O into hydrogen (H) and oxygen (O) using electricity. Electrolysers can use electricity at times when there is abundant surplus of electricity, to create hydrogen gas for storage. In principle, hydrogen can be stored and then used directly to produce electricity using gas turbines or fuel cells. However, hydrogen is a very light gas that needs to be highly compressed for storage. Itis also quite explosive and can even corrode metal. It is possible to store relatively large amounts of hydrogen (a few 100 GWh) over long periods of time, for example in salt caverns. However, compared to natural gas (primarily methane), hydrogen is difficult to store and transport and there is almost no existing infrastructure suitable for it. Biogas and synthetic gas are both produced from renewable sources. Biogas, a mixture of methane and carbon dioxide, can be produced by anaerobic digestion (AD) – the decomposition of biomass (for example, grass, animal manure or food waste) in an oxygen-free environment. Carbon neutral synthetic gas is made via the Sabatier process. Here, hydrogen (made by electrolysis) and carbon dioxide (from burning biomass, or from biogas) are combined to produce methane. Methane is easier to store than hydrogen. The Sabatier process can be seen as ‘upgrading’ hydrogen to a gas that is easier to handle. The process of using electricity to produce gaseous fuel is sometimes referred to as ‘power to gas’ (GridGas, 2012). Methane gas is also the primary component of today’s fossil fuel natural gas. The methane in biogas and synthetic gas can be stored in very large quantities just as natural gas is currently. 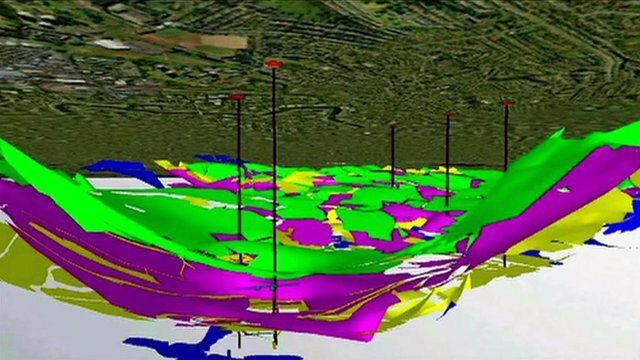 The UK today has a highly developed gas infrastructure that includes storage facilities, such as the Rough gas store off the coast of Yorkshire, which has a capacity of 35,000 GWh. However, methane is a powerful greenhouse gas, so it is very important that any escaping from pipelines or storage is kept to a minimum. Biogas and synthetic gas, once stored, can be burned in power stations (again, like natural gas today) to provide energy when electricity supply from renewable sources is insufficient to meet demand. Gas power stations burning biogas or synthetic gas can be flexible – we can turn them on or off quickly. We can use them as ‘back up’ generation to meet demand when electricity supplies from variable renewables fall short. They can also supply industry for very energy intensive processes which would be difficult to run on electricity. The processes involved in creating a significant biogas and synthetic gas back up system have many losses associated with them. As energy is converted between forms (electricity and biomass to gas, and back to electricity), we lose energy in the process – about 50%. However, the ability to store energy in this way forms an integral part of an energy system powered by renewables, and is a good way of using electricity which would otherwise be surplus to requirements. Who is making the technology happen? A Sheffield company called ITM Power  is developing and installing technology to make Power 2 gas a reality. Today, most plastics are made exclusively from oil or other fossil fuel derivatives. In fact, around 4 percent of the world’s oil production is used as feedstock to make plastics, with a similar amount consumed as energy in the process. Offering a potential solution is a company called NewLight Technologies which has produced a carbon negative plastic called AirCarbon. Instead of using oil, the input material is the methane emitted by sewage treatment plants, landfills, power plants, and other industrial sites. This process results in a useful product but also prevents methane from reaching the atmosphere and contributing to climate change. According to NewLight, AirCarbon is the performance equivalent of a range of plastics that includes polypropylene, polyethylene, and polystyrene. AirCarbon also lends itself to various manufacturing processes including extrusion, blown film, fibre spinning, and injection molding. The computer manufacturer, Dell, has started to use AirCarbon for a pilot project to manufacture protective bags out of this oil-free plastic. Meanwhile, US telecommunications firm Sprint announced that it will launch an iPhone case based on the revolutionary plastic. 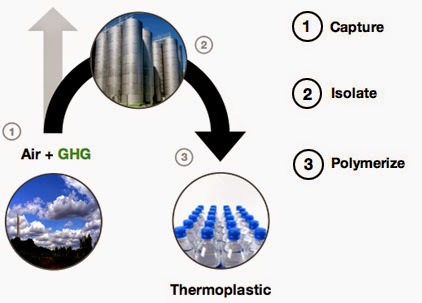 Newlight uses a biocatalyst to process the gases in a reactor, where the carbon is pulled out and rearranged into plastic polymers that can be used to make bags or other materials. The catalysts used with AirCarbon are 10 times more efficient than other solutions, making it an economic choice that is also carbon-negative (meaning it stores more carbon in the plastic than it generates during production). The process is independently verified to be carbon negative on a net basis by NSF Sustainability and Trucost. Researchers have developed a new process which will greatly simplify the process of sorting plastics in recycling plants. The method enables automated identification of polymers, facilitating rapid separation of plastics for re-use. Unlike metals, the quality of which often suffers during the recycling process itself, recycled plastics can be processed quite efficiently. “Polymers represent an interesting basis for the sustainable cycling of technological materials. The crucial requirement is that the recycled material should be chemically pure. In that case, bottles made of PET, for example, can be relatively easily turned into synthetic fibre for use in waterproof windcheaters,” says Langhals. 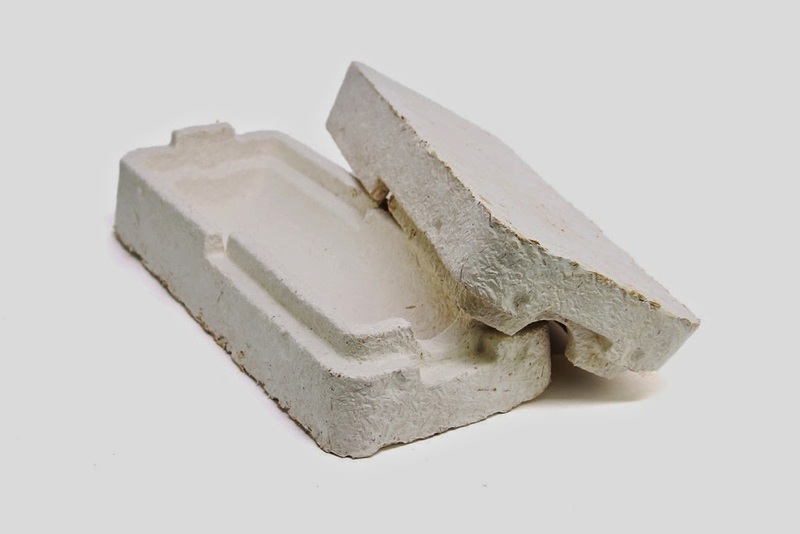 Ecovative has designed a new type of packaging which is grown from agricultural waste and mycelium (the root fungus part of muchrooms). Mycelium is a natural, self-assembling glue, digesting crop waste to produce cost-competitive and environmentally responsible material. Unlike plastics, which come from unsustainable petrochemicals, mushroom materials start with plant-based farm waste and can end up in your garden as a compostable material. The IT company Dell has started to use mushroom packaging to replace fabricated EPE- polyethylene foam parts that provide cushioning and bracing in large packages for Dell servers. The mushroom product can be used for packaging, insulation and even surf boards. It can be used to replace car plastics and engineered woods which typically use formaldehyde (a known carcinogen). In the 20th century the three nutrients nitrogen, phosphorus and potassium have enabled agriculture to increase its productivity. This is usually represented by three numbers (for example, 19-12-5). We obtain nitrogen from the air, but we must mine phosphorus and potassium. The world has enough potassium to last several centuries. But phosphorus supplies may start running out in the near future. The reserves of phosphorus aren't very evenly distributed. The U.S. is the world’s second-largest producer of phosphorus (after China), at 19 percent of the total, but 65 percent of that amount comes from a single source: pit mines near Tampa, which may not last more than a few decades. Meanwhile nearly 40 percent of global reserves are controlled by a single country, Morocco, sometimes referred to as the “Saudi Arabia of phosphorus.” Although Morocco is a stable, friendly nation, the imbalance makes phosphorus a geostrategic ticking time bomb. Each year more than 100 million tons of phosphate rock are mined and processed into fertilizer. Over time this fertilizer enters the ecosystem as waste and agricultural runoff, leading to excessive nutrient levels, or a condition known as eutrophication. Eutrophication causes excessive algae growth in lakes, streams and oceans which depletes the oxygen supply in the water that is necessary to support aquatic life. Our food contains the nutrients taken up by plants which we expel back in to the environment by our digestive systems and toilets. Whilst traditional sources from rocks are being depleted there is quite a lot of it in sewage treatment plants. Thames Water has installed new technology from Ostara in its Slough plant. It strips phosphorous from sewage water producing around 120 tonnes of fertiliser each year. The end result is a produce called Crystal Green. Waste water streams from municipal and industrial treatment facilities, rich in phosphorus and nitrogen, provide essential nutrient streams for the recovery technology. Fertilizer Production: Rather than view sewage as waste, the solution transforms waste water streams into a renewable resource, creating a planet-friendly fertilizer and saving millions in plant maintenance costs. Agriculture: Crystal Green is the world's first fertilizer made from a local, renewable resource. Suitable in horticultural, turf and agriculture, its slow-release formulation results in considerably less nutrient leaching and runoff. Food Consumption: The recovery technology is the ideal solution for growing urban areas where nutrient discharge limits become a challenge to meet in the face of rising volumes of waste water and associated costs. Environmental Impact: By reclaiming the nutrients in their municipal, industrial and livestock waste waters, most countries could actually become phosphorus-independent – and help protect water resources from these otherwise polluting nutrients.